Diablo OG Lime green buds wrapped in thick, dark orange hairs with striking crystals. 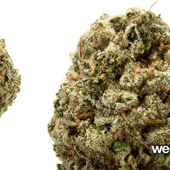 It has a very dank pine smell with a hint of lemon and a sweet and flowery OG taste. The instant effects are relaxing and pain relieving, a loosening of the muscles and a light numbing of the mind. A great appetite stimulant. Diablo has a THC content up to 20% with a short flowering time. Descended from Blueberry, Grapefruit and South African Sativa. Its definitely one of my top five strains. Sweet flavor. Hits you quickly. My favorite strain. Strong smell. Looks and taste like a kush, but with a sativa-ish high. Great for pain, effects lasted for hours, super relaxing. Sometime Diablo Og might not appear to have a high thc content but definitely stands its own ground.